Aryabhata, born in 476 CE, was the first in the line of great mathematician-astronomers from the classical age of Indian mathematics and Indian astronomy. There is a general tendency to misspell his name as “Aryabhatta” by analogy with other names having the “bhatta” suffix, but all his astronomical text spells his name as Aryabhata. He mentions in his work Aryabhatiya that it was composed 3,630 years into the Kali Yuga, when he was 23 years old. This corresponds to 499 CE, and implies that he was born in 476. Though his birthplace is uncertain, he went to Kusumapura (Pataliputra or modern day Patna) for advanced studies and lived there for sometime as the head of an institution (kulapati). Aryabhata is also reputed to have set up an observatory at the Sun temple in Taregana, Bihar. He wrote many books on mathematics, astronomy etc but most of them are lost today. His major work, Aryabhatiya, a compendium of mathematics and astronomy, was extensively referred to in the Indian mathematical literature and has survived to modern times. The mathematical part of the Aryabhatiya covers arithmetic, algebra, plane trigonometry, and spherical trigonometry. It also contains continued fractions, quadratic equations, sums-of-power series, and a table of sines. And Arabic translation of Aryabhata’s work is Al ntf or Al-nanf and it claims that it is a translation by Aryabhata, but the original Sanskrit name of this work is not known. The place-value system, first seen in the 3rd-century Bakhshali Manuscript, was clearly in place in his work. While he did not use a symbol for zero, the French mathematician Georges Ifrah explains that knowledge of zero was implicit in Aryabhata’s place-value system as a place holder for the powers of ten with null coefficients. However, Aryabhata did not use the Brahmi numerals. Continuing the Sanskritic tradition from Vedic times, he used letters of the alphabet to denote numbers, expressing quantities, such as the table of sines in a mnemonic form. This calculates to 3.1416 close to the actual value Pi (3.14159). Aryabhata used the word āsanna (approaching / approximating), to mean that not only is this an approximation but that the value is incommensurable (or irrational). This is quite a sophisticated insight, because the irrationality of pi(π) was proved only in 1761 by Johann Heinrich Lambert. After Aryabhatiya was translated into Arabic (during 820 CE) this approximation was mentioned in Al-Khwarizmi‘s book on algebra. Aryabhata discussed the concept of sine in his work by the name of ardha-jya, which literally means “half-chord (half-wave)“. For simplicity, people started calling it jya. When Arabic writers translated his works from Sanskrit into Arabic, they referred it as jiba. However, in Arabic writings, vowels are omitted, and it was abbreviated as jb. Later writers substituted it with jaib, meaning “pocket” or “fold (in a garment)“. Later in the 12th century, when Gherardo of Cremona translated these writings from Arabic into Latin, he replaced the Arabic jaib with its Latin counterpart, sinus, which means “cove” or “bay“; thence comes the English SINE. Alphabetic code has been used by him to define a set of increments. If we use Aryabhata’s table and calculate the value of sin(30) (corresponding to hasjha) which is 1719/3438 = 0.5; the value is correct. His alphabetic code is commonly known as the Aryabhata cipher. That is, find N = 8x+5 = 9y+4 = 7z+1. It turns out that the smallest value for N is 85. They were discussed extensively in ancient Vedic text Baudhayana Sulba Sutras, which date to 800 BCE. Aryabhata’s method of solving such problems is called the kuṭṭaka (कुट्टक) method. Kuttaka means “pulverizing” or “breaking into small pieces“, and the method involves a recursive algorithm for writing the original factors in smaller numbers. Today this algorithm, elaborated by Bhaskara in 621 CE, is the standard method for solving first-order diophantine equations and is often referred to as the Aryabhata algorithm. The diophantine equations are of interest in cryptology, and the RSA Conference, 2006, focused on the kuttaka method and earlier work in the Sulbasutras. In his contribution towards Algebra, Aryabhata provided elegant results for the summation of series of squares and cubes in his book Aryabhatiya. Aryabhata’s system of astronomy was called the audAyaka system, in which days are reckoned from sunrise, dawn at lanka or “equator“. Some of his later writings on astronomy, which apparently proposed a second model (or ardha-rAtrikA, midnight) are lost but can be partly reconstructed from the discussion in Brahmagupta’s khanDakhAdyaka. In some texts, he seems to ascribe the apparent motions of the heavens to the Earth’s rotation and he may have believed that the planet’s orbits as elliptical rather than circular. In the first chapter of his book Aryabhatia, he insisted that the earth rotates about its axis daily, and that the apparent movement of the stars is a relative motion caused by the rotation of the earth, contrary to the then-prevailing view in other parts of the world, that the sky rotated. Here, he gives the number of rotations of the earth in a yuga, and made more explicit in his gola chapter. Lunar and Solar eclipses were scientifically explained by Aryabhata by stating that the Moon and planets shine by reflected sunlight. Instead of the prevailing cosmogony in which eclipses were caused by pseudo-planetary nodes Rahu and Ketu, he explains eclipses in terms of shadows cast by and falling on Earth. Thus, the lunar eclipse occurs when the moon enters into the Earth’s shadow and solar eclipse occurs when Moon intersects Sunrays from falling on Earth. He discussed the size and extent of the Earth’s shadow (verses gola.38–48) and then provides the computation and the size of the eclipsed part during an eclipse. 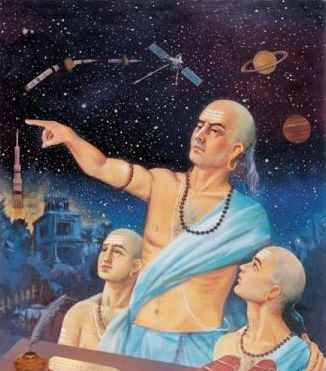 Later Indian astronomers improved on the calculations, but Aryabhata’s methods provided the core. His computational paradigm was so accurate that 18th-century scientist Guillaume Le Gentil, during a visit to Pondicherry, India, found the Indian computations of the duration of the lunar eclipse of 30 August 1765 to be short by 41 seconds, whereas his charts (by Tobias Mayer, 1752) were long by 68 seconds. Considered in modern English units of time, Aryabhata calculated the sidereal rotation (the rotation of the earth referencing the fixed stars) as 23 hours, 56 minutes, and 4.1 seconds; whereas the modern value is 23:56:4.091. Similarly, his value for the length of the sidereal year at 365 days, 6 hours, 12 minutes, and 30 seconds (365.25858 days) is an error of 3 minutes and 20 seconds over the length of a year (365.25636 days). Aryabhata advocated an astronomical model in which the Earth turns on its own axis. His model also gave corrections (the śīgra anomaly) for the speeds of the planets in the sky in terms of the mean speed of the sun. Aryabhata’s calculations were based on an underlying heliocentric model, in which the planets orbit the Sun, though this has been rebutted.